Newswatch: Doomsday Brexit or just not the success promised? Doomsday Brexit or just not the success promised? A recently leaked government report has suggested that Britain would see fuel, food and medicine shortages should no deal be reached with the EU. It is very easy to dismiss such dystopian projections as alarmist and a part of a project fear agenda. But a hard Brexit will result in some significant changes in the way everything is done when dealing with other countries. Brexiteers are perhaps right to say that new deals and procedures can be put in place. But it is all a matter whether such things are implemented and readied by the time Britain leaves the EU. Given that nearly two years after the EU referendum there is still no clear vision for Brexit laid out by Theresa May and her government. There have been few concrete plans put in place to deal with the potential fallout that might result in any number of possible Brexit scenarios. A so called hard Brexit and a crashing out of the EU without a deal is seen by many as being the worst possible outcome, although there are many advocates within the Tory party such as the likes of Jacob Rees Mogg. Few if any contingency plans have been put into place for a so-called hard Brexit which in the first instance would hit ports, such as Dover, airports and docks - indeed anywhere where imports from Europe and beyond arrive. As it stands there is relatively little paperwork needed to import into the UK from the EU since it is part of the Customs Union. People and goods can move across the EU without problems. But unless Britain can remain in the Single Market or quickly work out a trade agreement once the UK leaves the EU, small businesses could see any potential benefits of international trade eaten up by a tangle of red tape. Any extra tariffs imposed by the EU on imports from the UK could push up the sale price of those goods, devouring any competitive advantages Britain might have. While a member of the European Union, Britain is part of what is called the Customs Union, meaning it enjoys the benefits of trade liberalisation – namely, the easy transit of goods across national borders. If the UK leaves the Customs Union – an outcome looking more likely as the idea of a "hard" or "no-deal" Brexit takes hold – then it will lose the benefits of free trade and it will instantly become much more difficult for goods to travel. Trading will likely involve a great deal more paperwork. This is a particularly nasty outcome for SMEs [Small and Medium-sized Enterprises] with complex supply chains, for whom business could become almost impossible. Indeed many businesses have planned for a possible move from the UK if this happens, whilst others have already shifted some or all of their operations to mainland Europe [The Week]. Indeed financial services have already seen the strongest shift to the continent [Ev Standard]. There are also issues concerning VAT and tax rules which could add to the headache for many small exporters as well as increased prices for UK consumers [Guardian], though a recent FT article suggests Britain may try to be negotiating a deal on VAT rules. However, if Britain seeks to remain inside the EU VAT area, it will continue to be bound by rules set in Brussels. Rewriting the existing deals after Brexit could also prove a herculean task, with the Financial Times reporting the UK could face reworking more than 750 individual global trade agreements. Whilst there has been much talk and discussion, little, if anything, has been set in stone. Last month it was revealed that part of the M20 on Kent would be used as a 'car park' for lorries to counter so-called Brexit traffic jams [Guardian]. This came only months after customs officials said they had no idea what reality they must start preparing for in April 2019 when Britain was set to come out of the EU [Independent]. A former civil servant Ruth Lea has dismissed the recent leaked Brexit report that suggested the port of Dover would collapse within a day as "absolutely bizarre" and suggested it was just a re-run of "project fear" [Express] . However, if there are no clear guidelines or rules for customs officials at Britain's ports there could very well be serious problems. Currently there are few if any major checks of lorries going into or coming from mainland Europe. But even the slightest delay can result in tailbacks and heavy congestion around the ports. Anyone who has ever used the Dartford River Crossing, which crosses the River Thames via the M25 from Essex into Kent, will perhaps remember the huge tailbacks resultant from the tolls where every vehicle had to stop and hand over money - even the DART prepaid scheme made little difference as vehicles still needed to slow down at the allocated tolls before the barrier was raised. Since the implementation of ANPR [Automatic Number Plate Recognition] cameras and online payments traffic flows pretty much unhindered. There have certainly been problems since the implementation of the automatic charging system in particular the fact that many foreign drivers avoid payments and fines [BBC]. However, it would hard to find anyone wanting to return to the old system of toll gates and the resultant traffic jams. But even with the fast track automatic tolls there can still be problems. A simple breakdown or accident can quickly result in long tailbacks. The problems with the DRC highlight how simple hold-ups can quickly create traffic chaos. Should paperwork problems at Dover and other ports cause delays the speculation that the port could 'collapse' is not too far fetched. Some have suggested the government might in effect throw open Britain's borders in the event of a no-deal Brexit. But officials fear the EU, particularly the French, would not do the same. Furthermore, 'throwing open' the borders would have many undesired effects especially in terms of thwarting people, drugs and weapons smuggling. It is very easy to point a finger at the bureaucracy of paperwork. Brexiteers will no doubt blame the EU should it impose strict checks on traffic coming from Britain. But it has to be remembered it already applies such checks on other non-EU countries where no formal trade agreements or customs agreements are in place. There are some examples which highlight the difficulties in transporting goods between the EU and countries not in the Customs Union, such as Norway and Switzerland. Carnets and other documents are often required with heavy fines imposed for incorrectly filled in submissions. There are additional costs too for the documents themselves and those transporting the items may often be required to submit to checks which could take many hours. "I've delivered goods across the Norway border and it's not as straightforward as we are being told by the politicians," says Ciaran Donovan, the owner of a courier firm which transports exhibition materials as well as vehicle parts all around Europe. "Due to the nature of the goods I was delivering, I was advised to get a carnet - a passport for goods. They vary in price but this one cost £750. It took my customer one week to compile the carnet, and everything had to be listed." "I arrived in Norway, I was stopped by customs and told to park up while they check everything in my van against what was listed on the carnet, a process that took five hours." [Mirror]. This is of course just one business owner's experience, and how he sees huge problems ahead should Britain pursue its course for leaving the EU and in particular the Customs Union. But it is surely clear that simply dropping out of the EU, and along with it the Customs Union and Single Market, without contingency plans is a recipe for chaos. On the surface it might seem an over-egged exaggeration that Britain might see empty supermarket shelves, medicines becoming unavailable and fuel shortages. But it takes very little for such crises to develop. 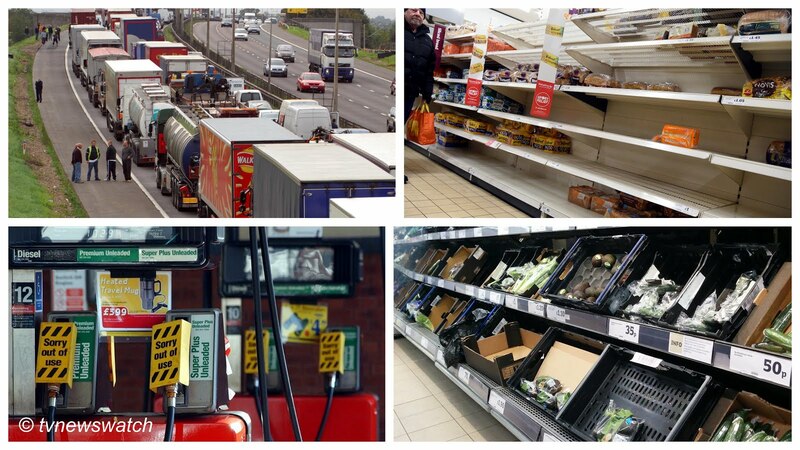 In the last year or so there have been scenes of empty supermarket shelves in Britain, not because of Brexit and customs checks but because of inclement weather. In March this year supermarkets saw shelves emptied of bread and tinned soup as the so-called Beast from the East snow storm disrupted deliveries and precipitated panic buying [Sun / Metro]. And in February 2017 there were vegetable shortages due to weather problems in Spain resulting in many supermarkets rationing certain items whilst others found themselves almost stripped of fresh produce altogether [BBC]. It's not hard to see how delays at the ports could result in similar issues. Indeed the problem could be further compounded should Britain's domestic farming industry suffer from labour shortages, as some have also predicted [Guardian]. One official told the Times that "supermarkets in Cornwall and Scotland will run out of food within a couple of days" of Britain's leaving the EU without a deal, and that the government would have to charter aircraft or use the RAF to ferry supplies to the furthest corners of the UK. This would certainly not improve Britain's image around the world as a country open for business. Most medicines distributed around Europe are certified under one umbrella, specifically by the European Medicines Agency, a European Union agency responsible for the protection of public and animal health through the scientific evaluation and supervision of medicines. The agency has been based for some years in Canary Wharf, London, but has already finalised plans to uproot and move to Amsterdam [Guardian]. But aside the obvious snub, comes a much harsher reality. The relocation will lead to a loss of investment from pharmaceutical companies with some also relocating closer to the agency. There will also be a local economic loss particularly for the London hospitality and service sectors. The EMA reportedly generates demand for 350 hotels per night, five days a week in order to host its 40,000 visiting guest experts. The relocation will also harm UK academia. With the EMA's departure, London loses its status as the focal point for European medical research and technology, with all the positive impact this has brought in terms of collaboration with local universities and institutes. And there is also the human impact this decision will have. Some 900 staff who have built their homes and lives in our capital are now having to choose between relocating to another country, opting for an elaborate and impractical commuting arrangement, or finding another job. But aside the blow to the UK's economy, global standing and patient services, it may also prompt an EU-wide public health crisis due to the disruption caused to the agency's work. It has also been suggested that UK patients may soon find themselves cut off from accessing potentially life-saving drugs. Without agreement between Britain and the EU there would be serious disruption to patients' continued access to existing and new medicines, with a recent estimate that a hard Brexit could mean UK patients end up waiting six to 12 months longer than those in EU states for new, potentially life-saving drugs. One reason for this is that the EMA currently undertakes a significant proportion of the work required for licensing new drugs in the UK. Outside EMA membership, Britain's national body, the Medical Health Regulatory Agency [MHRA] will need to urgently find the resources to carry out 25% more licensing of new drugs come March 2019 [New Statesman]. The issues surrounding any possible deal between the UK and EMA is just one factor when it comes to medicines. Another important and much overlooked issue is that of Britain's membership to Euratom. While Euratom is not a part of the EU as such, Theresa May, on attaining office, quickly put forward her vision of Brexit as not only leaving the entities of the Single Market and the Customs Union but of Euratom too. At the same time her government has said it wants to have close ties and to sign an agreement which would facilitate Britain maintaining provisions set out under the oversight of Euratom. But the UK's nuclear chief has described the leaving of Euratom an "existential threat" to the industry and that the nuclear industry faces "disruption to absolutely everything". The transport, trade and regulation of nuclear materials, components and know-how is governed by a series of nuclear safeguards that have operated in the UK for four decades through the Euratom treaty. And without a deal there could be significant problems concerning the transport of nuclear fuel [Sky News]. But there is also the issue concerning the supply of medical isotopes, a byproduct of the continental European nuclear industry, critical for cancer treatments. Without a deal, such treatments could also be in jeopardy. And Britain has already missed a number of important deadlines [Guardian]. With no extra £350 million for the NHS - indeed there's been talk of increasing taxes to fund it [Sky News] - and possible shortages of medicines Brexit is going to be an extremely bitter pill to swallow. Could Britain really run out of fuel because of Brexit. It might sound laughable but a short fuel strike in 2001 almost brought Britain to a halt. Petrol was rationed for drivers providing essential services and forecourts across the country ran out of fuel in days. It's easy to see how a key disruption in a supply chain can quickly halt deliveries, but how would Brexit affect the fuel industry. Press articles, including the Times which broke the story, have not made clear how forecourts would run out of fuel within a week because of a so-called hard Brexit. However, Britain is increasingly reliant on foreign imports and with the UK already facing significant threats to the future security of the UK energy system they are likely to be enhanced by the uncertainties of the Brexit process [Impact of Brexit on UK Energy System - Durham University]. So will there be a disaster as of midnight on 29th March 2019? Will there be 20 mile tailbacks from Dover, Harwich and other major ports with similar scenes across the channel by the morning? Can we expect to see panic buying and food shortages as shoppers begin their weekend shop? And will people grab more petrol than usual as the hysteria sets in? No-one can really predict for certainty. It has to be said there will definitely be disruption should Britain get no deal. And that could well precipitate a domino effect. And things could get very messy indeed. Should you feel you need to start prepping now you could save up and get your very own Doomsday kit from Costco, a snip at only $6000 [Guardian]. Or perhaps you'd prefer the calming reassurance from the government who maintain that Brexit won't mean Armageddon [The Times] even if UKIP's former learder Nigel Farage has apparently turned tail and claimed he never said Brexit would be a success [Twitter]. Well, that's a relief! It won't be Armageddon. But it won't quite be the success we were told it would be either!